There is no cream in this chocolate cream pie. Yet creamy is the best adjective I can think of to describe this delectable non-dairy dessert. 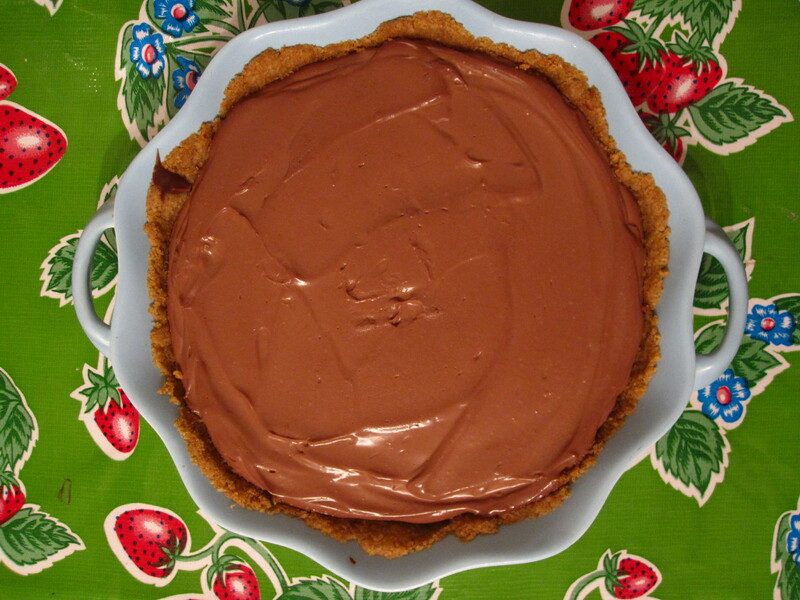 Despite it lacking the milk fat typical of cream pies, this one packs a flavor punch that will satisfy any chocolate craving. Plus you don’t have to feel [too] guilty when you eat a piece with breakfast, lunch, and dinner, as well as for a midnight snack. For how awesome an outcome this recipe produces, it’s shockingly simple to make. Though, I highly highly recommend using a food processor (as opposed to a blender) if at all possible. A blender did the trick, but took far longer than it needed to (and anything that can shorten the amount of time before a pie enters your life is a very, very good thing). Place silken tofu into a food processor or blender and blend until smooth. Melt chocolate chips in a double-boiler (or a metal bowl over a pot of boiling water works fine too). Add melted chocolate chips to tofu and blend. Add maple syrup and vanilla extract and blend, scraping sides if necessary to make sure everything is incorporated. 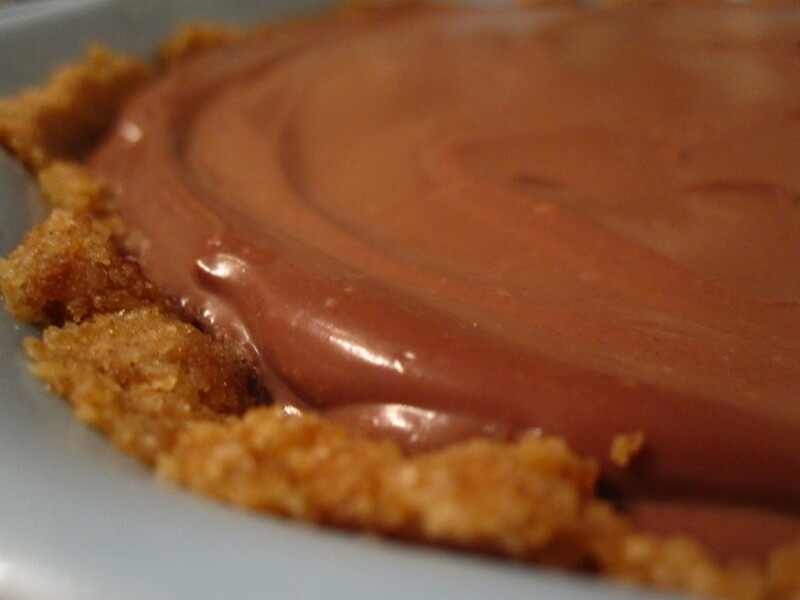 Spoon chocolate tofu mixture into pie crust. Chill pie until ready to serve (4-6 hours is perfect). Preheat oven to 375 F. Lightly oil a 9-inch pie pan. Put the oats into a food processor and process until it’s flour. Add the remaining dry ingredients and blend. Drizzle in the oil as you’re pulsing the mixture. When it’s thoroughly wet but still crumbly it’s done. Put the mixture into the pie pan, and starting at the center, flatten and press it with your fingers until it covers the bottom and extends up the sides. Bake for 8-10 minutes, until it it is crisp but not overdone. 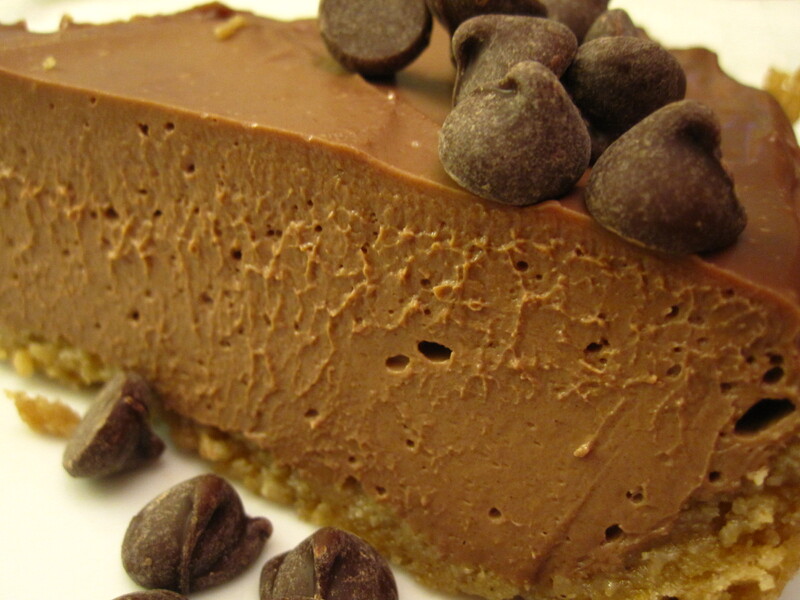 This entry was posted in Gluten Free, Pie, Vegan and tagged chocolate, gluten free, pie, vegan. Bookmark the permalink. Oh my god, this just made my LIFE. So, when I come up we are baking! heck yes we are baking. anything you want girl! mmm, i want to try to make this!